Each year the LBRN program has an annual meeting in which program participants, committee members and administrators meet to review individual research accomplishments and to discuss the overall program activity. Summer research faculty and graduate and undergraduate students are encouraged to present their LBRN sponsored research, and talks are scheduled to highlight sponsored research projects from partnered campuses across the state. Oral Presenters: INBRE Full Project PIs, Pilot Project PIs, Summer Graduate Students, and invited guests. Poster Sessions: Pilot, Translational, and Startup Project PIs, 2018 LBRN Summer Faculty, and Graduate Students are required to submit an abstract to participate in the poster session. LBRN Undergraduate Summer students are also invited to participate. Poster abstract submission form will be sent after your registration. 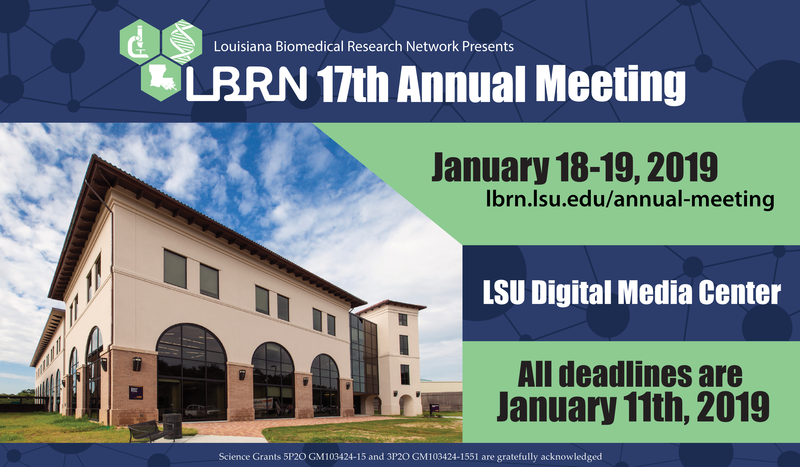 This year's meeting is being held on January 18-19th in Baton Rouge, Louisiana at the LSU Digital Media Center at the Center for Computation and Technology and LSU Emerging Technology Center. Directions - When you enter the Digital Media Building (follow the signs when you approach the building to the front door, there is a round reception desk, go to the right, down the hall, to the conference room. There are restrooms nearby. Baton Rouge Traffic is notoriously difficult in the morning across the I-10 Mississippi bridge if you're coming from the north, actually taking the old bridge is a viable alternative. Coming from New Orleans or I-12, we recommend taking the Acadian Exit to go down Stanford and then by the lakes, and then turning left in front of the LSU Emerging Tech Center and then right into the Parking Lot for CCT. Be sure NOT to park in any red marked lots, the regular spaces are fine. Do NOT Park on lake side of building. More parking instructions will be provided closer to the meeting time. Confirm your participation in the LBRN 17th Annual Meeting by registering. Registration is required to participate in the program, obtain hotel lodging if needed, provide meeting space, materials, food and beverage at all the planned functions. Hotel reservation information and abstract submission forms for the Poster and Oral presentations will be provided with your online event registration. We look forward to your participation at the meeting! Lodging arrangements have been made at the nearby Courtyard Baton Rouge Acadian Centre/LSU Area at a special group rate. Hotel Reservation is indicated with your online event registration. Do not book your hotel. Please register for the conference and select if you require a room. Use the link in your confirmation email to reserve a room. Note: after the deadline you will not be able to receive the discounted hotel group rate. No reimbursement for hotel or mileage. Provide time/date leaving and returning to your residence/school. Also provide odometer beginning/end or mileage map calculation for mileage justification for a mileage reimbursement at 54 cents per mile. Note: Mileage reimbursement not to exceed a maximum of 200 miles (total round trip mileage). If you are going to be driving more than 100 miles you may want to consider renting a vehicle. Please follow department's policies and procedures. If an account code is required, please contact Ms. Alexis White at alexisw@lsu.edu. First send Ms. Alexis White, alexisw@lsu.edu, an email for request for vehicle rental for travel reimbursement purposes. Then contact your travel agent or Enterprise Rent-A-Car for vehicle rental and have it charged to your personal credit card. Insurance is not reimbursable for domestic travel. Keep all your receipts along with gas receipts for travel reimbursements request. Please use the state contracted rates for Enterprise. Only the cost of rental of compact or mid-size/intermediate model is reimbursable, unless 1) non-availability is documented, 2) the vehicle will be used to transport more than two individuals. Reimbursements require a receipt for regular unleaded gasoline, or diesel when applicable only to the driver renting the vehicle. Insurance billed by vehicle rental companies (i.e., CDW or LDW) is not reimbursable for domestic travel. * Personal Accident Insurance, Supplemental Liability Protection and Roadside Assistance is not reimbursable. To obtain a room, you must register for the event by the deadline. You must reserve a room using the link in your registration confirmation. Incidentals are the participant's responsibility. Internet will be available at LSU. INBRE Full Project PIs and Pilot Project PIs, 2018 LBRN Summer Faculty, Graduate and Undergraduate Students, INBRE funded students, and other biomedical researchers in the state are required or invited (as appropriate) to submit an abstract to participate in the LBRN Poster Session beginning on Friday, January 18, 2019. Velcro hooks, placed on the back of the poster, are needed for poster display setup - they will be provided at registration. Poster size may be up to 4 ft wide X 4 ft. tall. Abstracts for the poster presentations will be printed in the program. The poster abstract cannot exceed 2000 characters. Please avoid using scientific notation and special characters in your abstract. The abstract submission form will be emailed to you after your event registration has been completed. Selected LBRN INBRE Project PIs are required to submit an abstract for his/her research presentation. The oral presentation abstract submission form is emailed to Full Project PI's (make sure to select proper title! in registration form!). The abstract cannot exceed 2000 characters. Abstracts for research presentations will be printed in the LBRN 17th Annual Meeting Program. Deadline for all the Full Project oral presentation abstract submissions is January 11, 2019. The link is emailed with the online event registration. If you did not receive it, contact John Quebedeaux. 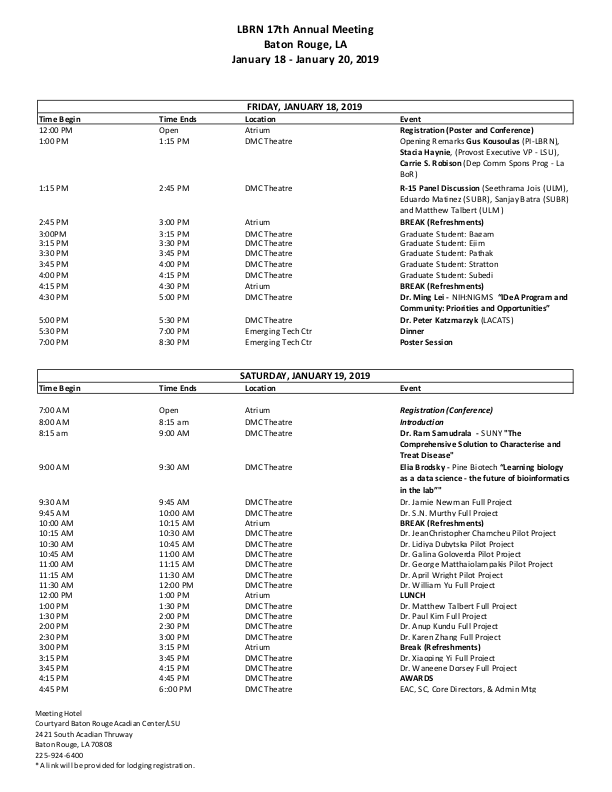 Below are the details for your oral presentations (please see the agenda for the assigned time) at the Annual Meeting on either Friday 18th or Saturday the 19th. 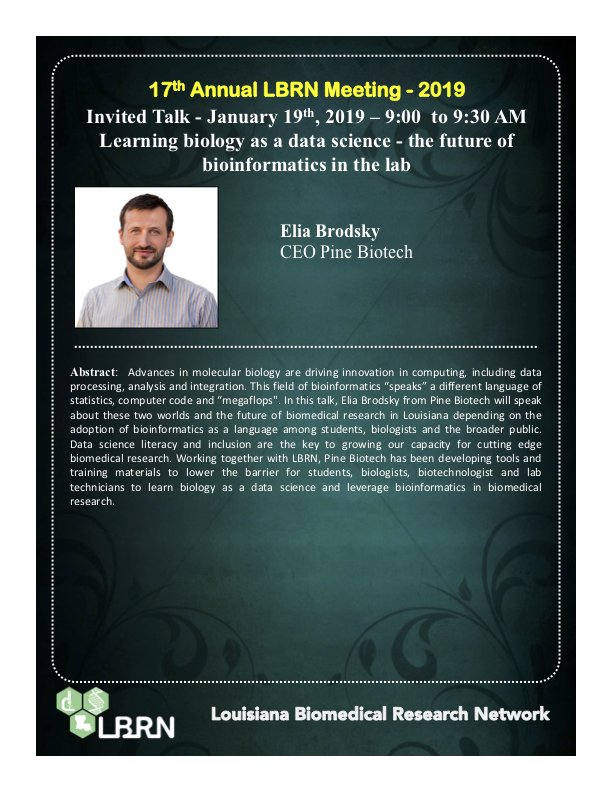 The Full project PI's are invited to give a 20 minute presentation highlighting the progress of their LBRN research project during the past year. As indicated, in the suggested presentation outline below, this presentation is different from a presentation normally made at a research meeting and must be designed to summarize your project and what has been acomplished during the past summer. After the presentations, the Full Project PI's will have an opportunity to meet with the LBRN EAC regarding their research project. Did you encounter any impediments in accomplishing your project? If so, what steps did you take to overcome this? Summarize measurable accomplishments such as papers, abstracts, grants submitted or funded, and students trained. Address how does this fit within the overall time line for the project. How your project will lead into the area of Clinical Translational Research and Community Based Participatory Research? In order for us to be on schedule, we ask that you do not exceed the number of slides listed or the time allotted for your presentation since you will need time for questions and answers. Include any images/movies/etc. into the presentation file (i.e. make sure they are embedded if you referenced external files). Use the standard typefaces on your system. We will be using a single laptop to do all the presentations in the interest of saving time for the presentations. 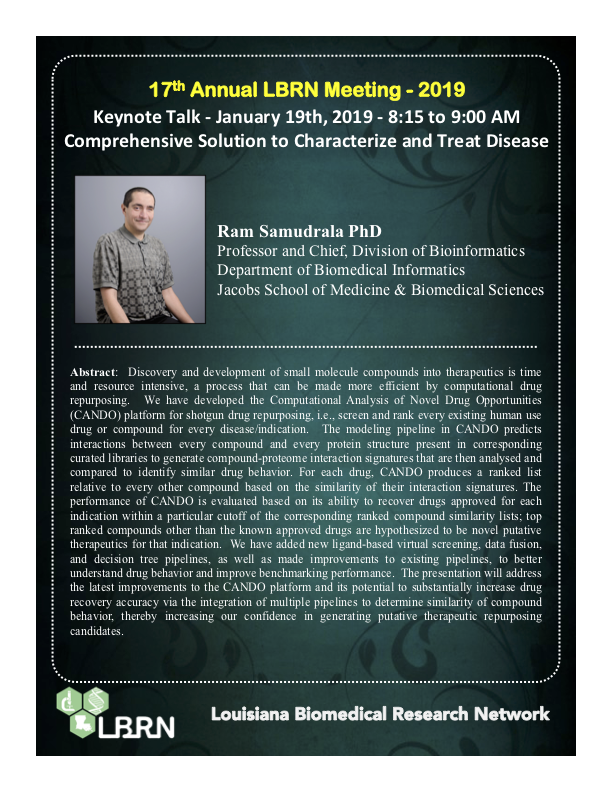 The deadline to have the slides is Thursday, January 17, 2019. An emailed link will be provided to upload your presentation. If you have any questions, please contact Ms. Alexis White, alexisw@lsu.edu.